The Holy Nobleborn Prince of Serbia Lazar (Lazarus) lived during the XIV Century – at a time when the Turks, having conquered neighbouring lands, prepared an invasion of Serbia. 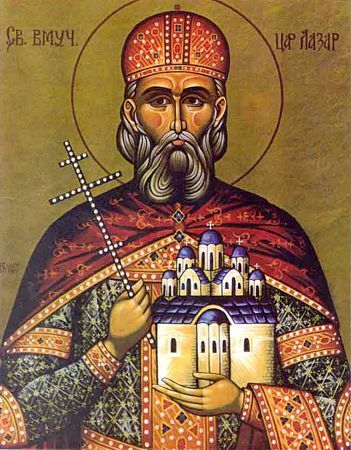 Saint Lazar was raised at the court of the holy king Dushan. He was appointed governor of one of the Serbian districts. In the year 1371 he was chosen king of all Serbia and he toiled much at strengthening the condition of the country. He pacified neighbouring princes, which had wronged or plundered Serbian settlements. And he was concerned for the Christian enlightenment of the nation, he built churches, supported the monasteries and charitable establishments. In 1380 the saint established the monastery at Rovanetz. Saint Lazar petitioned the Constantinople Patriarch for an agreement of recognition of the Archbishop of Serbia by the Patriarch. During the course of the 10years of his rule, Serbia was at peace. Afterwards there began war with the Turks. At the time of the Kossovo Battle the wounded king was taken prisoner and on orders of Sultan Bayazet was beheaded with a sword on 15 June 1389. The body of the holy king Lazar was buried at a nearby church. In 1391 his undecayed relics were transferred to the Rovanetz monastery. The monastery was destroyed by the Turks in 1683, and the relics of king Lazar were transferred to the monastery of New Rovanetz on Mount Thruzh.